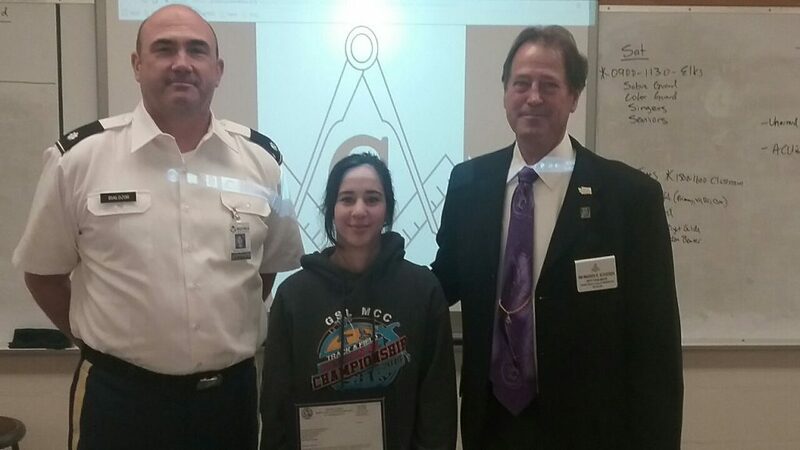 Walla Walla High School Junior ROTC cadets hosted a guest speaker yesterday to learn about the role of values-based organizations in American history, and to present a letter of commendation to a cadet who applied lifesaving lessons learned in the program. He discussed the historic comparison between the values and virtues expressed in the cadet’s code, Army Values taught in the JROTC program, and the direct similarity to those virtues expected of Masons everywhere. Schoeben, whose official title is the Right Worshipful Deputy Grand Master of the Most Worshipful Grand Lodge of Free and Accepted Masons of Washington, traveled from the Grand Lodge office in University Place to be here for the visit. He is in line to become the next leader of the historic Fraternity. The organization will have its annual session in Yakima in June. 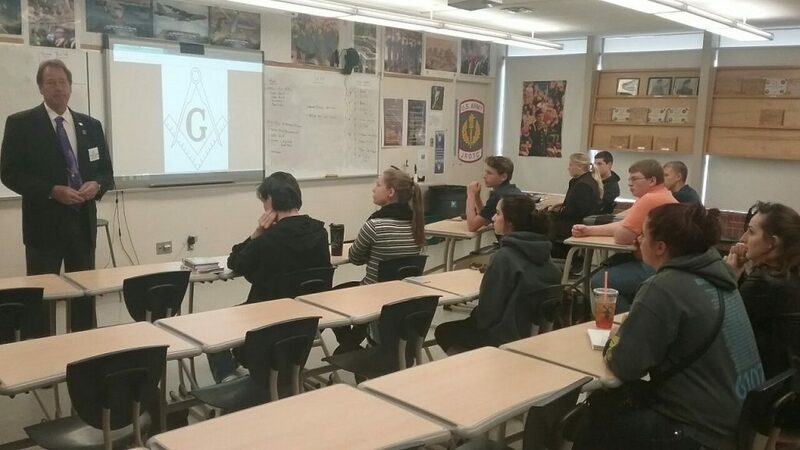 His visit exemplifies Masonry’s ongoing commitment to community outreach, history and education. 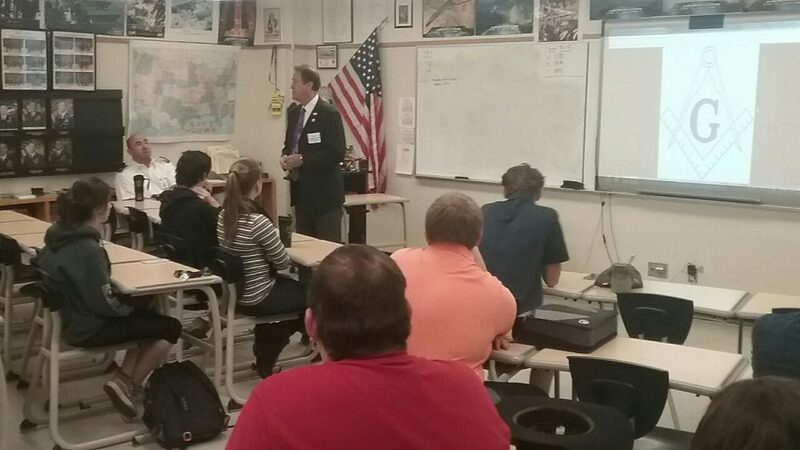 Following his short prepared remarks, Schoeben answered questions from the seniors in the program. The cadets learned about the civic service commitments, philanthropy, values and virtues and how they parallel between organizations like JROTC, which helps cadets develop good citizenship in their communities, and Freemasonry whose historic leaders help give birth to America. He also advised the cadets of scholarship programs available through Freemasonry and stressed the importance of education to individuals and the resulting benefit to communities after they receive their higher education degrees. Before leaving, Schoeben presented a Washington Grand Lodge letter of commendation to Cadet Major Mariam Hart for her quick and lifesaving actions in March, when she applied the Heimlich Maneuver and rescued a choking teacher on campus. To learn more about Freemasonry in Washington and its many services to community, visit their web site at: https://freemason-wa.org/ or call 800-628-4732, or visit a Masonic Lodge in your area.